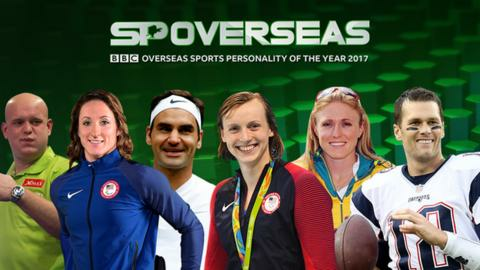 Voting has now closed for the BBC Overseas Sports Personality of the Year 2017. Six contenders were shortlisted: Tom Brady (American football), Roger Federer (tennis), Katie Ledecky (swimming), Tatyana McFadden (Para-athletics), Sally Pearson (athletics) and Michael van Gerwen (darts). The award recognises the overseas athlete who has made the most substantial contribution to sport this year, and the winner will be announced on the BBC Sport website before the main Sports Personality show on BBC One on 17 December. The quarterback who led one of the greatest comebacks in Super Bowl history as the New England Patriots sealed a 34-28 overtime victory over the Atlanta Falcons. Brady was named Super Bowl Most Valuable Player for a fourth time after his team overhauled a record 25-point deficit to claim victory at Houston's NRG Stadium. After struggling in the first half, Brady finished with a record 466 passing yards and became the first quarterback to win five Super Bowl rings. In a record seventh appearance in the game, he beat his own Super Bowl record with 43 pass completions. What he said: "Thanks to everyone back in Boston. We love you, we're bringing this sucker home." Became the first man to win Wimbledon eight times and extended his record to 19 Grand Slam titles. At 35, victory over Croatia's Marin Cilic made him the oldest man in the Open era to claim the singles title at the All England Club. Earlier in the year, Federer also won the Australian Open with a five-sets victory in the Melbourne final over old rival Rafael Nadal. Federer, Muhammad Ali and Usain Bolt are the only people to have won the BBC Overseas Sports Personality award three times. What he said: "I knew I could do great again maybe one day, but not at this level." Won six medals, including five golds, at the World Championships in Budapest. Showed her versatility by taking titles in the 400m, 800m and 1500m freestyle events, as well as the 400m and 800m freestyle relays. She also won a silver when edged out over 200m by Italy's Federica Pellegrini. Ledecky's haul in Hungary took her past Missy Franklin's mark of 11 to a women's record of 14 career world gold medals. She was named Sportswoman of the Year by the Women's Sports Foundation. What she said: "It's a great feeling. I always put my best foot forward and do my best." The Russian-born wheelchair racer recovered from serious illness to win all four of her events at the World Para-athletics Championships in London. She had not been able to compete for much of the season after suffering severe blood clots in her legs which required surgery. But the seven-time Paralympic gold medallist took the T54 titles in the 200m, 400m, 800m and 1500m. McFadden, who moved to the United States as a child after being adopted from a Russian orphanage, won the Chicago Marathon for the seventh consecutive time and finished second in the New York race. What she said: "I knew it was going to be really hard. I was just so proud of myself." The 2011 world and 2012 Olympic champion was competing in her first major global championships for four years after overcoming serious wrist, hamstring and Achilles injuries. She missed the world championships two years ago after surgery on her left wrist. At one stage she feared her hand would have to be amputated following a fall in a race which caused a "bone explosion". What she said: "It wasn't surprise, it wasn't shock, I was just proud. So proud of what I had done to get here." Beat defending champion Gary Anderson to win a second PDC World Darts Championship. The world number one won 7-3 at the Alexandra Palace in a match that contained 42 180s, a record for a single darts match. He also broke a record getting there - posting the highest average in world championship history, 114.05, in his semi-final victory over Raymond van Barneveld. Van Gerwen won a third successive Masters and Grand Slam of Darts, a fourth straight European Championship, retained his Premier League title and became only the second player to hit two nine-dart finishes in one match - in a UK Open qualifier.